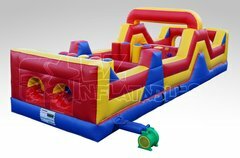 An obstacle course rental in Lafayette from Bouncing Buddies can provide a vibrant and striking centerpiece for all types of events, both indoor and outdoor. It's also the perfect way to draw in guests of any age to break the ice with some friendly competition that will keep them climbing, sliding, crawling, running, and most importantly, laughing. Give your guests a unique experience that they will bond over and long remember. In addition, an obstacle course rental from the Lafayette area's premier party rental and entertainment company can simplify your event planning. 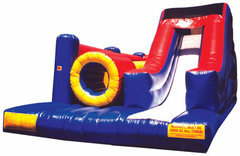 Our obstacle courses can serve as the party theme, decoration, and of course, the entertainment! At Bouncing Buddies, we pride ourselves on offering our event rental customers great value without compromising safety or quality. Rest assured that our products are frequently and meticulously cleaned and sanitized with antibacterial disinfectant at our facility, so you can feel confident that your obstacle course will arrive at your Lafayette area venue in perfect condition, sparkling clean and ready for your guests.